If you are one of the many people who rely on caffeine to keep you going during the day, you may need to watch your intake if you start to have trouble sleeping at night. Understanding the effects that caffeine has on your body as well as how long it keeps you awake, can help you make informed decisions as to how much is safe to consume. Caffeine is found in many beverages such as coffee, tea, sports drinks and soda; it can also be found in foods such as chocolate and it is even added to certain medications. Caffeine acts as both a central nervous stimulant and a diuretic; it increases the amount of fluid your body excretes, says MedlinePlus. People's sensitivity to caffeine varies. Some feel effects with one cup of coffee, for example, while others can drink several cups with no adverse effects. Caffeine is considered a drug and it can affect many systems in the body. After ingesting caffeine, you may begin to feel the effects within 15 minutes. Caffeine reaches its peak level in the blood within one hour and can stay in your system for four to six hours, reports the Food and Drug Administration. 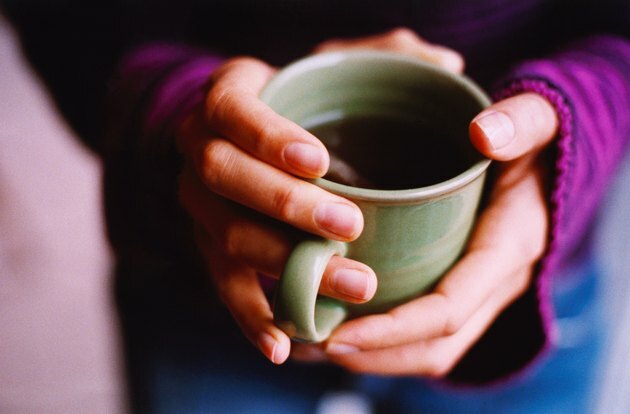 If you consume caffeine every day, your body can build up a tolerance. Initially one cup of coffee may have kept you awake for one or two hours, but now it may take two cups to get the same effect. The more coffee you drink, the more you may need to stay awake. You may even develop physical dependence or addiction. Since every case is different, your symptoms will tell you when you are consuming too much. To avoid problems, MedlinePlus recommends limiting your intake to 200 to 300 milligrams -- or about two to four cups of brewed coffee -- a day. However, even that amount may be too much. You will need to cut back if you feel nervous, irritable, have trouble sleeping or develop an upset stomach, irregular heart beat or tremors. The amount of caffeine that can cause these symptoms varies based on your age, body weight, general health and how often you consume caffeine. In addition, drinking caffeine in the morning to combat fatigue may be masking an underlying sleeping disorder. If caffeine is keeping you awake at night, there are some steps you can take to improve your sleep quality. Since caffeine blocks sleep-inducing chemicals in the brain and increases adrenaline production, it is best to avoid it for several hours before bedtime, suggests the National Sleep Foundation. Developing good sleeping habits by going to bed and getting up at the same time every day will also help. Practicing a relaxation technique right before bedtime can relax the body and mind and promote sleep. If you have developed a dependence on caffeine and experience withdrawal symptoms, talk to your doctor. He can help you develop a plan to safely cut back.